The only thing worse than a surprise surge of piping hot water in your shower is the almost supernatural loud bang of knocking over a bottle of shampoo. Seriously, it’s nearly as effective as a cup of coffee at raising your heart rate. You know what you need? A nice shower caddy. Not just any shower caddy will do. There are quite a few different styles to choose from. First things first, drill or no drill? If you’re looking for a quick solution that requires no extra hardware, then a hanging, tension pole, suction cup (or adhesive), or freestanding shower caddy will work. Naturally, you will likely need a walk-in shower for a freestanding caddy. Tension pole caddies might be able to fit in your tub shower if you have enough clearance to get the pole on the side of the tub and reach the ceiling. If you have a drill and aren’t afraid of drilling through your fiberglass or tile, then you have quite a few options for a more permanent shower caddy or shelving. A sturdy, attractive shower caddy really ties your shower together. Many shower caddies, and just about any metal product that is intended to come into contact with water, are made of stainless steel. Does that mean these things won’t rust? Stainless steel does not readily corrode, rust, or stain when it comes into contact with water. In environments where there is low-oxygen, high salinity, or poor air circulation, it will eventually rust. Sometimes the steel just isn’t high quality, or isn’t even stainless steel. Type 304 stainless steel is standard for consumer goods that come into contact with water. If stainless steel is scratched, then the chromium molecules in the area will reform the protective coating when it’s exposed to a wet environment. Chrome-plated steel is nearly indistinguishable from stainless steel to the untrained eye, but is much more susceptible to corrosion. It’s also cheaper than stainless steel and you will see chrome-plated steel used in some shower caddies. Chrome-plated steel is not capable of reforming the protective layer when scratched like stainless steel. Aluminum is another option that we prefer over stainless steel for shower caddies. If you aren’t afraid of a little DIY project, then there is a way to take any steel shower caddy and add an extra layer of protection from rust. Add a few coats of Rust-Oleum Clear Enamel to your caddy. Be sure not to miss any spots! This will add years to any steel shower caddy. If the finish eventually wears off, just carefully scrub off any rust and apply another coat. Hanging shower caddies will work in just about any shower. The only exception being if you have a shower head that extends from the ceiling. If you have a dual shower head (handheld and fixed), make sure there’s enough room to fit the caddy and it doesn’t interfere with you using your handheld shower head. Worried about it sliding down your shower head pipe? Fear not, there is a solution. 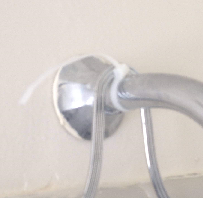 Simply use a zip tie or gear tie and wrap it around the shower pipe. This will provide something for the shower caddy to rest on. Almost every hanging shower caddy that claims to not slide down your shower arm is going to do exactly that. You can count on it. If you’re planning on buying a hanging shower head, then follow our recommendation above and at least get a zip tie and save yourself the trouble. A combination of the adjustability and quality of materials is what makes this hanging shower caddy our top choice. Fits a shower pipe with 0.80 inch diameter. Shelves slide vertically and horizontally. This version of the simplehuman shower caddy does a great job of solving the typical hanging caddy problems by using adjustable shelves and taking advantage of suction cups to provide stability. It’s one thing to claim your shower caddy is adjustable, and it’s another to deliver with a proper implementation. You get great vertical adjustability so that you can fit large bottles on the top shelf and you get great horizontal adjustability by being able to slide the shelves. If you have tile, no worries, the suction cups pivot to avoid the uneven cracks. The maximum length of the caddy can extend to 39 inches from top to bottom. The baskets are about 5.9 inches wide and 14.5 inches long. The smallest length you can set it to is about 26 inches. So be sure you have at least that much space between your shower head and valve. At 16.25″ wide, this caddy has tons of space. You’ll want to keep heavier bottles near the middle to prevent swaying, but otherwise this is a very nice option at a good price. 2 Razor slots and 4 hangers. This is a popular model from mDesign and has solid reviews with no significant trouble regarding rust. The two suction cups give you nice stability, but heavier bottles should be kept near the center. This extra-wide model is great for shared bathroom situations, as there are plenty of slots for razors and room for other personal care items on the second shelf. As with all suction cups, you’ll have to have a smooth surface for them to adhere properly. Tile with a rough finish won’t work in these cases. This model is specifically designed with handheld shower heads in mind. The swivel baskets are handy in positioning bottles and each basket has holes to store the bottles upside down for easy pouring. The baskets swivel outward and give you room for tall bottles. There is enough space for two people to put their different soap, shampoo, and conditioner. You get 4 hooks to hold razors, toothbrushes, wash cloths, and other cleaning goodies. There’s nothing adjustable about the height of this caddy, only the ability to swivel the baskets. This is a model that would greatly benefit from a coating of Rust-Oleum that we mentioned before. This caddy is highly recommended if you’re looking for an all aluminum caddy. This would be our top choice, but the placement of the shelves doesn’t work well if you have a lot of larger bottles. Other than that, this is a great caddy. One advantage to keeping the shelves centered on the caddy is that when you take a heavy bottle off it won’t shift very much when the center of gravity changes. This Zenna Home shower caddy is made of aluminum, so there isn’t any concern about rust. The anti-slip collar helps keep the caddy on the shower head pipe, but remember you can add a zip tie or gear tie for extra support. The overall height is 22.5 inches and width is 11 inches. That’s wide enough to fit most taller bottles on the sides of the top shelf. The over-the-door shower caddies with two points of contact with the shower door, instead of just one with the shower head, are more stable. When considering this type of caddy, you’ll want to measure the thickness of the door or frame to make sure it isn’t too wide. Most of these caddies fit a maximum width of 2″, but you can find wider ones. Very similar to the hanging shower caddy top pick, this simplehuman over-the-door shower caddy has versatility and quality. The pivoting suction cups are a huge help if you have a tiled shower and guarantee you can get a good seal. Shelves adjust horizontally and vertically. If you have a tiled shower, then you’re going to want some freedom to move the suction cups away from the crevices between tiles, so it gets the stability it needs. Anything less simply won’t work. This simplehuman adjustable caddy can extend out to 33″ total length and as short as 18″. 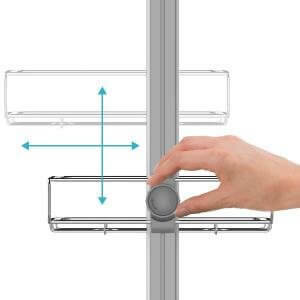 The hanger is adjustable from a maximum of 2″, so be sure your door is no more than 2″ thick. The good thing about the simplehuman shower caddy is they have a 5-year warranty. Any rust trouble? No problem. This makes the extra cost worth it. Spacious with swivel shelves for extra space to fit large bottles. This is a stable over-door shower caddy at a great price. You also get hooks on exterior of your shower for hanging towels. Fits up to 2″ wide doors. This InterDesign shower caddy is made of steel with Thermobond Rust Resistant Coating. Similar to the simplehuman shower caddy above, the baskets on the side swivel outward to make room for taller bottles on either the bottom shelf or the side baskets. The dimensions of the side baskets are 2 1/2″ high, 4″ x 4 1/2″ wide. The center baskets are 2 1/2″ high, 4″ x 10 1/4″ wide. The part that hangs over the door is 2 inches wide, so it will not fit over a door larger than that. This popular model has adjustable height baskets with plenty of space. It fits doors up to 2.5″ thick and is made from stainless steel. This Zenna Home shower caddy has baskets that detach and can be moved up or down the ladder. It has a razor and bar soap storage. Also, it has the largest hanger width of any caddy shown yet. At 2.5″ max thickness this caddy will fit a very wide door. These are primarily for walk-in showers, but you may have a shower and tub combo that can fit one of these in the corner. These also can add storage space to your vanity! You can find many different styles and worry less about water resistance if you want a cheap way to add storage to your vanity area. Tension poles are tricky. We try to include all the information you need to make sure each pole will fit your setup, but keep in mind that your ceiling needs to be able to withstand quite a bit of force to keep a tension pole upright, especially with a full rack of shampoo bottles. We favor over-the-door caddies as an alternative to tension poles, but you may not have a door on your shower, so that limits your options. If you have a completely tiled shower, including the ceiling, then you shouldn’t have much trouble. The tile will handle the force of the tension rod well. This tension pole shower caddy has the convenience and versatility you expect from their brand. The reinforced aluminum pole and compression spring makes sure the caddy fits securely in place. There’s plenty of storage and adjustable shelves to fit taller bottles. Snaps right into place. No fidgeting with the tension. Shelves are made of chrome-plated steel. Tension Pole is made of aluminum. This simplehuman model is just a superb tension shower caddy. You get what you pay for. The shelves are adjustable and slide up or down. The pole extends from 6 to 9 feet. You also get storage hooks and towel hangers. Quick dispensers mean you can store bottles upside-down and dispense them through holes in the shelves without having to remove them from the caddy. How big are the shelves? They are a quarter circle with a radius of 6 inches. The shelves are made of steel. Some people report having zero rust after several years, and others report having rust after a year or less. This is likely due to differing water composition. You can help avoid rust completely by just coating the baskets in a clear enamel. The rest of the caddy is made of aluminum, so that’s all you have to worry about. If you’re looking for something a little more elegant, then the bronze finish on this caddy is a nice change from the steel look. More difficult to install than the simplehuman. If you’re looking for a different aesthetic, then the bronze finish adds a more elegant look to your bathroom. This caddy is not adjustable, but you have plenty of room for larger bottles on the bottom or top shelf. You can, however, change the order of the shelves. The finish is a ThermoBond rust-resistant coating. Eventually, you can expect some rust to appear. The pole extends from 5 to 9 feet. The trays are adjustable and large to accomdate any size bottle. This tension pole is the longest of our top models at 10′ 4″. The trays are well supported and sturdy. You can expect more life from these trays than some of the baskets on cheaper metal caddies. While it may not be as attractive as some of the other caddies listed here, the plastic shelves mean you don’t have to worry about rust. The shelves will come into more constant contact with water than the tension pole due to wet bottles. Put simply, suction cup caddies can’t hold as much weight as any of the other types. You also must have a smooth surface for them to adhere to. Tile is fine, but it needs to be a glass-like, smooth tile. This will not work with tile that has a rough or textured finish. As long as your tiles are smooth and non-porous, then you should be fine. However, be aware that suction cups need about 2″ of smooth surface to adhere to without grout lines. So smaller tile just won’t work. If your tile has a matte finish then suction cups won’t work no matter the material. Ensure the contact point for both the wall and suction cup are dry, clean and free of debris. Give the suction cup a counter-clockwise turn to make sure the cup starts out flat. Place the suction cup firmly against the wall and press the knob in to expel any air that may inhibit proper suction. While maintaining pressure with one hand on the back panel of the suction cup, turn the screw clockwise to lock the suction cup to the wall. This suction/adhesive shower caddy has superior “sticking power” to just suction alone. The adhesive sticker requires a 4″x4″ without grout lines and works on smooth surfaces only. 4″x4″ area free of grout lines is required for adhesive. If you’re frustrated with suction-only caddies then consider this shower caddy. Each adhesive sticker can hold up to 15 lbs! Most shampoo or soap bottles weight a pound or two at most, so there is not much concern with weight. You can see that this shelf is smaller than most other caddies shown here, but they’re affordable, and you can purchase more than one. The advantage to that is that you can space them however you want. You could even put them on different sides of the shower to separate your soap from your spouse or roommate. This is a basic suction cup shower caddy that fits into a corner. We highly recommend getting the above adhesive model, but you may not have the 4″x4″ space for the stickers. Despite the many great reviews, you’ll see people complaining about the suction cups not working properly on every single suction shower caddy you look at. Be aware you won’t be able to store lots of heavy bottles. Also, be sure to use alcohol to clean the area where the suction cups will go. This is another 2-tier shower caddy from HASKO that isn’t a corner model. It’s almost exactly like the one above except you don’t need a 90 Degree corner. If your shower doesn’t have a smooth 90-degree corner then this is a good standard shower caddy to use. The same note about the corner model applies to this caddy: you have to make sure to clean the area under the suction cups with alcohol and don’t expect this caddy to hold a lot of weight. This type of shower caddy is recommended for larger walk-in showers. Your main concern is picking out one that will fit the bottles you commonly use. There isn’t much that can go wrong with these since they simply sit on the floor. Hopefully, your shower floor has some slope to it so that water falls toward the drain. Depending on the amount of slope, your standing shower caddy may be unstable. That’s why my top recommendation has adjustable feet. For most freestanding shower caddies, it’s not a big issue once you’ve got bottles loaded up on the shelves. The weight adds stability. Some showers do have quite a bit of slope, and the OXO is a great high-quality, adaptable shower caddy. Remember to follow my recommendation above for adding some rust-proofing to your metal caddy. Excellent adjustability, non-slip feet, convenient hooks and bottle-cap holes are the main reasons this is our top choice. The extra top shelf is why we pick the OXO over the simplehuman model. This OXO shower caddy stands 3 feet tall, which is about waist level for someone that’s 6 feet tall. It’s a nice height, and you shouldn’t have to bend over much at all. As I mentioned above, the feet are non-slip and adjustable. That means they accommodate uneven flooring and stays balanced. The shelves are removable and adjustable for cleaning and have drainage slots. This unit also has bottle holes so that you can keep your soap and shampoo upside down. This corner shower caddy from simplehuman has all the necessities and comes with a 5-year warranty. It’s made from stainless steel and aluminum. The shelves are adjustable. One thing lacking with the simplehuman freestanding shower caddy is that it’s about 7 inches shorter than the OXO. That may not be an issue for you, but it’s inconvenient for someone much taller than 6 feet. The shelves are adjustable and removable, so cleaning them or applying some Rust-Oleum is simple. The feet are adjustable as well, so that takes care of uneven flooring. Overall, this isn’t the top choice because of the height and less storage, but it’s a great shower caddy. This caddy is spacious affordable. It is not adjustable, but if that’s not an issue for you then this is a good buy. It’s made from steel coated with nickel. This 4-tier freestanding shower shelf has the most storage space of the caddies in this category. However, it is not adjustable in any way. Just be aware of how much slope your shower floor has and use your best judgment. For most people, it likely isn’t an issue. This BINO shower caddy, which stands at 32 inches, is about 4 inches shorter than the OXO and about 3 inches taller than the simplehuman. The shelves are about 9.5 inches apart, so you can easily store just about any bottle you need, and of course, the larger ones can go on top. If you travel or find yourself using public showers and need somewhere to store your bathroom supplies, this is the solution for you. This is a must if you like to go camping and need a bag that won’t soak up water. It’s called a mesh shower caddy, but it’s probably more appropriate to call it a shower bag. This mesh bag easily dries and has 8 compartments. The handle can be used to hang on hooks or pegs. This is a great product if you live in a dorm, use a gym shower, or go camping.